Sword Canes became popular during the 18th and 19th centuries. It was less socially acceptable to openly carry a sword in public, so the stick sword emerged. This was a cane, umbrella or stick with an edged blade inside. These function as a typical walking cane or working umbrella with a sharpened, edged blade that could be easily and quickly removed from the shaft. Classic Umbrella Sword for sale feature a hidden 15 inch steel blade. These popular, classic styled full size umbrellas have a functional black nylon construction umbrella with a steel frame and a narrow pointed steel beveled blade inside the umbrella mechanism. They have a hook shaped wooden handle and feature a push button to release the blade from the umbrella shaft. The umbrella and the included storage sleeve are manufactured of black nylon. 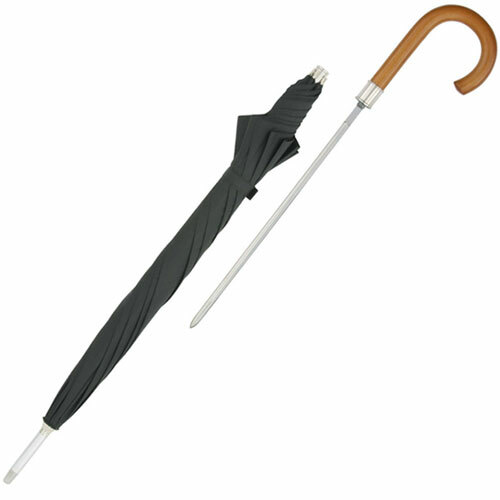 Buy these popular Umbrella Sword collectibles for only $39.99. Telescoping Umbrella Swords for sale weigh only 18 ounces. 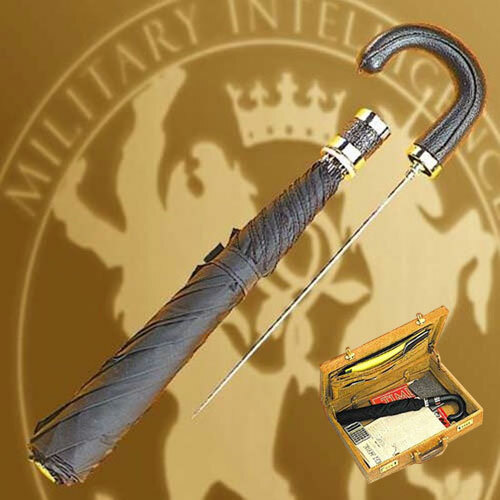 These lightweight premium collectibles feature a full size functional umbrella that houses a pointed sword blade that can be drawn with the umbrella opened or closed. The sharpened 10 inch surgical stainless steel blade is spring tempered to flex up to 30º. Although they have a double lock system to prevent accidental opening, the blade lock system has a smooth, fast draw action. The blade lock system is separate from the umbrella mechanism to prevent accidental opening. The umbrella telescopes to 18 ¼ inches and features double nylon fabric that creates a 36 inch wide dome. They include a storage sleeve and directions for use. Buy the Telescoping Umbrella Sword for $79.99.